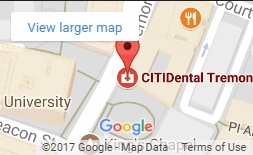 Our office is established and maintained by the finest team of dentists and professionals in Boston. Our team is committed to treating patients using the highest standards in dental technology and care. We create an inspiring, comfortable, and relaxed environment for patients to have their treatments in. We encourage our patients to be informed decision makers and understand the value of their dental health. Our website is designed to help patients be knowledgeable and understand a range of topics pertinent to dental care. You can read about dental implants, cosmetic dentistry, and dental diseases to help you prepare for your visits. Our dentists specialize in a range of cosmetic treatments to help you improve or maintain a healthy, confident smile. Whether you are looking for teeth whitening or a complete smile makeover, our office can offer a variety of solutions. We will discuss with you the available options and make recommendations based on what will provide you the best results. Please call our office and schedule your complimentary consultation today!